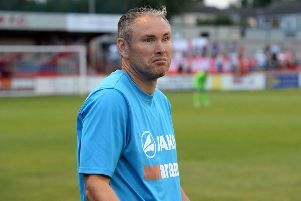 Banbury United booked a trip to Hungerford Town in the next round of the FA Trophy following an impressive 3-1 victory at Yate Town in Saturday’s preliminary round tie. All four goals came in the second half through Ricky Johnson, Callum White and new signing Nicholas Kalakoutis, who opened his United account, before Harry Horton grabbed a late consolation. Yate had the better of the opening stages, Kane Ingram’s cross landed on top of the bar and Horton shot just over from ten yards. United replied when a Darius Browne cross found Johnson but his shot was comfortably saved by Martin Horsell. Yate still created the better chances, Ingram’s shot from the edge of the area was saved by Jack Harding but Jake Jackson failed to trouble the United keeper. Yate again dominated after the restart and Jackson blasted over when he should have done better. Johnson dragged his shot wide before he broke the deadlock in the 57th minute when he raced clear to beat Horsell. With Yate committing players forward United looked dangerous on the break, Mark Bell set-up Browne whose shot from the edge of the area went just wide. But United doubled their advantage in the 68th minute when Zac McEachran put White through and he beat Horsell with his shot going in via the far upright. United made the game safe three minutes from the end when a neat flick from Bell released Johnson down the right side of the area and he got to the bye-line before crossing for Kalakoutis to convert at the far post. Yate reduced the arrears two minutes into stoppage-time when Horton slotted home a low cross from the right.